Yoga Magazine: "The Yoga News"
The Yoga News is a monthly yoga magazine published online through International Yogalayam. It features current yoga-related news and articles of interest to yoga teachers, yoga students, and anyone interested in personal growth and transformation. What Makes The Yoga News Different? You won't find it filled with class schedule updates, events or pitches for yoga classes or workshops, or all the typical newsletter promotional stuff. What you will find is Unique and sometimes even controversial yoga articles that will make you stand right up and go "hmmmm ... I never thought about that before!" Just take a peek at some of the past articles linked in the right-hand menu and you'll see right away that this yoga magazine truly is "something different!" All you have to do is subscribe via the form at the top and wait for the next issue to arrive in your inbox. It's that easy! PS. If The Yoga News doesn't live up to your expectations, don't worry, you can easily unsubscribe any time. 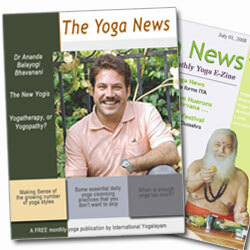 Read this article by Yogacharya about why he created The Yoga News.